This small and chubby little tuxemon has little self-confidence, so without its unique feature, it would be practically useless in battle. However, with the love and support of its trainer, the tuxemon can transform into a very strong and courageous form! Patheak, the Self-Confidence tuxemon, is a Water-type monster. 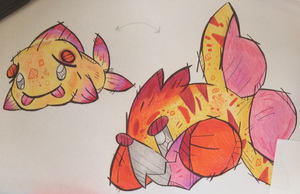 Patheak is not the only tuxemon based on a blobfish. Uglip is also based on a blobfish. 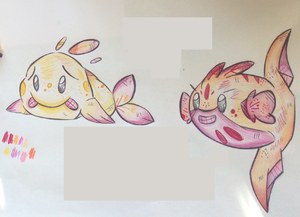 They are based on Blobfish (first form) and Ocean Sunfish (second form). They are also based on the concept of self-believe and courage. May also be based on the fact that blobfish look like normal fish at the correct depth - or this may be a happy coincidence. This page was last modified on 13 April 2019, at 06:17.